Merriam-Webster online defines Karma as: "the force generated by a person's actions held in Hinduism and Buddhism to perpetuate transmigration and in its ethical consequences to determine the nature of the person's next existence." Come to the premiere Friday night to see our take on it. 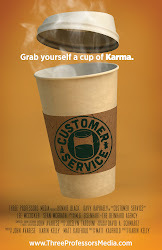 Grab yourself a cup of Karma!